Click here to read the story from the October 27, 2017 issue. Men don’t typically have a big voice in the fight against breast cancer, but the American Cancer Society is changing that by partnering with prominent local businessmen, health care professionals, and public servants. 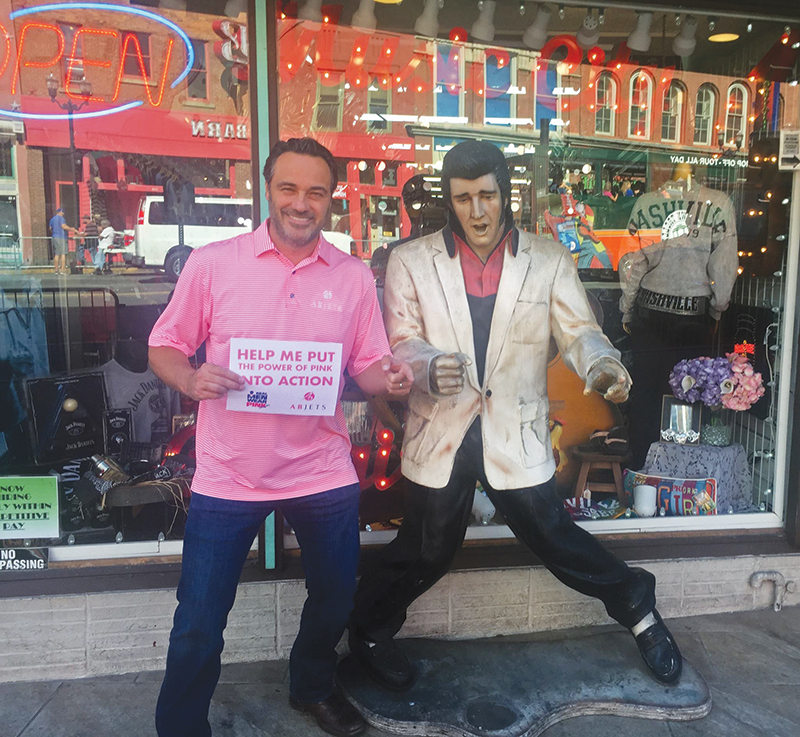 The society’s Real Men Wear Pink fundraising campaign, now in its third year, raised $150,000 combined over its first two years in Memphis, and the goal this year is to top $100,000. The 27 men wore pink every day during October, which is designated as Breast Cancer Awareness Month. The men represent a wide variety of local government agencies and companies, including First Tennessee, Fred’s, Kroger, The Peabody and West Cancer Center. The top fundraisers so far this year are Andrew Bettis, president of AB Jets; Freeman Peterman of Chuck Hutton Chevrolet; Tim Liebmann, executive VP and COO of Healthcare for Fred’s Pharmacy; and Josh Robinson, co-owner of PT Squared LLC. Robinson held a golf scramble on Oct. 12 at Wyndyke Country Club to raise money, and then on his birthday he did 20 burpees (full-body push-up exercises) for anyone who donated $20 or $25. The men are able to use the American Cancer Society’s mobile FUNdraising app and post about their campaign on social media. Bettis raised more than $11,000 with a pink party on Oct. 19 at Lafayette’s in Overton Square. “Cancer in general is a horrible thing, and the American Cancer Society does many things to fund research and promote awareness for all cancers,” he said. About 252,000 women and 2,470 men in the U.S. will be diagnosed with breast cancer this year, according to the American Cancer Society, and 40,610 will die from the disease. The American Cancer Society works to save lives in the Mid-South by providing education and resources to help women get screenings and treatment. Its Community Health Advisor program, which touts more than 100 volunteers, identifies at-risk neighborhoods, educates women, and provides much-needed resources. The campaign contributes to the overall success of the Making Strides Against Breast Cancer 5K Walk, which was held on Oct. 22 at the Liberty Bowl, marking its 17th season locally. The event drew 5,000 walkers despite the rainy weather and raised more than $600,000. Since 1993, more than 13 million Making Strides supporters have raised more than $810 million nationwide. Donations can be made at MakingStridesWalk.org/RealMenMemphisTN.